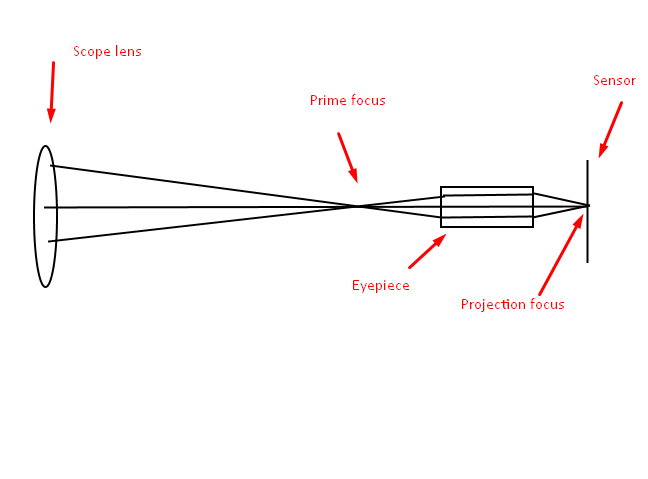 I was replying in another thread about imaging with small sensor and long focal length scope on alt-az, which is pretty much same type of imaging as EAA - short exposures, and came up with idea and suggestion for OP to try eyepiece projection. It dawned to me that large reduction in focal length can be obtained with combination of eyepiece and careful positioning of sensor. For small sensor, aberrations might be tolerable. Perfect setup for EAA. Eyepiece can be seen as positive lens element (compound lens) - same as regular 2 element simple focal reducer. One just needs enough in focus travel, and close placement of sensor to eye lens of eyepiece (eyepiece with T2 thread and camera directly screwed to that without extension tubes). This could probably only work on SCT / RC scopes and perhaps some refractors - ones with enough back focus. For example, in regular configuration with my 8" RC - F/8 scope by using 32 mm plossl and sensor placed at 40mm (problem is of course determining exact center of the lens, but I suspect that it can be found with some experimentation) would give F/2 system with 400mm FL! Very fine for small sensor with small pixels like ASI178. I've not tried EP but have been thinking about how to focus most of the light from the objective/flattener on to an area the size of a smallish sensor chip. A normal focal reducer/flattener still spreads the light out in order to fill an aps-c area. I thought maybe a good quality 2" ed eyepiece could do what I had in mind. I have a kit 2" 28mm lens but there doesn't seem any simple way of attaching it to the scope optical train or of attaching a camera to it. Another idea was maybe a Barlow if it could be spaced not to increase the focal length. I'm sure what I'd like to do must be possible! I just don't know exactly how! - Barlow won't be much of a use in this scenario - it is negative lens and negative lens spreads light over surface making things bigger on sensor (we use it to get magnification). It can be used to collimate incoming beam of light (make it parallel) - which can be useful for some applications like transmission diffraction grating (Star analyzer) - which works best in collimated beam, or perhaps solar Ha applications where filters work best again in collimated or close to collimated beams. You of course need another positive lens to focus parallel beams back sensor. - Eyepiece and focal reducers, or even simple binocular lens - any positive lens element can work as focal reducer. It concentrates converging beam to converge even more. Difference of course will be on how fast it converges beam - reduction factor, and what sort of aberrations it adds to wavefront - sometimes these aberrations are beneficial because they cancel already aberrated wavefront from objective - these are correctors (SCT, MCT) or field flatteners, coma correctors (ones with focal length reduction). - For best application with small sensor you need to take into consideration aberration free field of instrument / scope. Let's say that your instrument has aberration free (or another name for it is corrected) field with diameter of 30mm and your sensor has diameter (diagonal) of 10mm. If you use perfect reducer, maximum reduction that you can have without introducing field aberrations from instrument is 1/3. You can go even further than this but only if your reducer is correcting for outer field aberrations of your instrument or you accept edge of field deterioration. - I have no idea if eyepiece will be better or worse in handling wavefront aberrations than a simple reducer (something tells me it might since eyepieces are carefully designed for best performance). It probably depends on type of eyepiece used. For starters I would go with simplest plossl design - being simple and affordable option. Next step up - I would look at well corrected eyepieces with flat field. I don't think eyepiece needs to be wide field one, but it will certainly help in regards to vignetting in very aggressive reduction. - Mounting of eyepiece projection system is really straight forward - if you can use eyepiece on your scope to observe visually, you probably can do eyepiece projection with it - focus position will be inward from regular observing position of eyepiece. Most scopes are able to accommodate this I believe. This way eyepiece will work in "regular configuration" or first configuration (see post 1.). They are available in number of diameters so many eyepiece designs can be fitted with appropriate one. I've seen couple of other designs also. Important thing with eyepiece projection is understanding reduction (or magnification - you can use it as magnifier as well) relation. It depends on focal length of eyepiece. If you place sensor at distance equal to two times focal length of eyepiece you will effectively get no reduction nor magnification - this is "relay" configuration - eyepiece just relays image at scope focal plane to its own focal plane on the other side. If you increase sensor distance you will get magnification, if you decrease sensor distance you will get reduction. In most cases for EAA you want second option - reduction (faster system), and this is why you want to mount sensor as close to eyepiece as possible. If reduction is to aggressive you can always add T2 spacer to bring it down. Yeah - it's complicated, ha ha! I did just try with the 2" 28mm eyepiece. I don't normally use eyepieces at all so this was it's first time out of the box. I should have realised that the output from the eyepiece is intended for eyes... Duh! So, although the diameter of the glass is quite large, the output image is small - maybe only 5mm. Fine for an eye! I'd thought a 1.25" eyepiece would be too small and shut off too much light - defeating the object (I was just fiddling but I guess I need to move the eyepiece close up to the field flattener so it would be like your second diagram above.) I'll have another fiddle again tomorrow in the light. The thing is, will the image size being projected still be so small? If it seems to actually work as desired I still don't have a means of attaching a camera to test it. It's times like this I wish I had a 3d printer... Maybe I'll be able to cobble something together just to try it in the day. How did you measure output image? Eyepieces in combination with scope give certain exit pupil, but diagram for eyepiece / eye combination is different than that of eyepiece / camera combination. So you see, red, green (? maybe grey, I can't really tell) and blue beams are parallel when exiting eyepiece and are concentrated in exit pupil that is rather small (just a few mm in diameter - to fit human iris). Eyepiece is "moved forward" than when looking with eye, and beams are no longer parallel, but converge again. Depending on "speed" of convergence - we have couple of cases - magnified image, 1:1 image and reduced image. This means that we cant judge illuminated field from exit pupil of eyepiece. Field stop and "speed" of telescope might provide us with some data needed to calculate fully illuminated field, but I don't think that we need to do that. We just use long focal length eyepiece - it already has large field stop, and we just place sensor closer than twice focal length of eyepiece. I just projected the 'real' image on to a piece of paper. I'll try moving the eyepiece closer? in tomorrow. I was doing all these optical calculations a year ago in physics at uni but I've forgotten it all now! Have you tried the eyepiece projection yourself? Fact that it's winter (or cold if not calendar winter) does not make things easier. A lot of neighborhood is burning fuel for heating (wood, coal) so air quality is poor as well - lot of haze and smog. I had a play around with my ST80 and 5Mp microscope camera. I found I could get a real focus point with a 20mm EP and the focus tube racked in as far as it would go. The ST80 normally has a focal length of 400mm and aperture 80mm i.e. f-ratio = 5. With the EP in place the focal length was about 343mm, so f-ratio = about 4.3. I only had the camera (loosely!) connected via a cardboard tube so getting (and keeping) focus wasn't easy. I managed to take a couple of snapshots using SharpCap. The problem is that the focal point seems to be at what is just the eye relief. That was too close to be able to use a qhy5l-ii or gpcam. The way around that, I'm thinking, is to just use a simple convex lens rather than an eyepiece but I'd need some way of holding it in place and holding a camera in place. If I had a 3D printer I could probably make one. I have been thinking about getting one - an Ender3 Pro, maybe. I have to say I'm a bit confused as to how an actual reducer works. I have a x0.79 one on my 115mm apo which has a focal length of 800mm (f6.95). So the reducer should effectively reduce that to 632mm i.e. f5.5. Yet the physical focal length is still the same? I assume that all the x0.79 reducer actually does is change the way the light cone converges? Anyway, it seems to work! That is very interesting, so you tried configuration number 2? One that uses prime focus of scope? I suspected that spacing might be an issue in such configuration - one needs to put sensor fairly close to eye lens to make it work. How about first configuration - I suspect that in this configuration you will have more room to adjust sensor distance, but you also probably need to rack focuser quite a bit out, maybe even use extension, or diagonal mirror to get enough backward spacing? Reducers work in similar (yet opposite) way to barlow. Barlow diverge incoming rays, while focal reducers converge incoming ways. Spacing between sensor and focal reducer determines reduction factor. It is effective focal length of scope + reducer that changes. Best to view scope + reducer (or barlow) as a single unit, or compound lens. Such compound lens will have different focal length, and in case of reducer it will be shorter than original scope focal length - this gives wider field of view and "speed" of system since there is same effective aperture but shorter focal length. From this diagram you see that focal point moves "inward" with focal reducer (outward with barlow) and space between two stars (on-axis and off-axis, or black ray and red ray) is less with focal reducer (reduction of image) and more with barlow (amplification of image). You can also see that using eyepiece in front of focus (or camera at prime focus) as reducer will require very close positioning between eyepiece and sensor. First configuration allows more "room" for adjustment, because 1:1 distance is twice the focal length of eyepiece, so if you use 20mm eyepiece, you will need sensor at 40mm distance to get no reduction or amplification, and at 20mm distance you will get x0.5 reduction - making ST80 very fast F/2.5 system. I'm still a bit confused! My 800mm scope is still 800mm between the objective and the camera sensor even though I have a reducer in between. 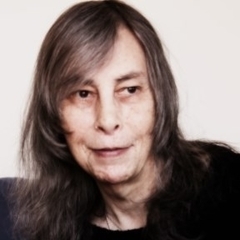 Obviously, the distance between the reducer and sensor is fixed at the 'standard' 55mm. Am I right in thinking the change in physical focal length is small, which is why it's not obvious to me? The eyepiece projection I did was from inside the normal focal length of the ST80. As I say, that is 400mm but I focused at ~343mm with the EP in. I'm not sure which configuration that is? I suppose your original post, second configuration has the EP further away than the normal focal point? And that gives the longer distance to the sensor? 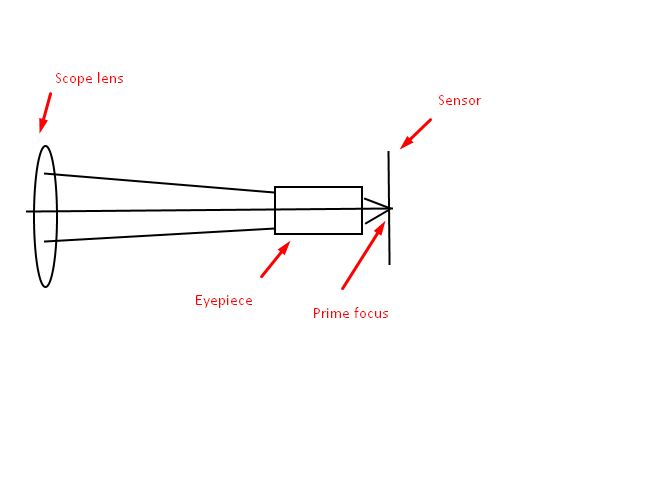 Physical distance between objective lens and sensor will be a bit smaller - simple focal reducers usually require a bit of inward focus travel, but it is very small amount - as per diagram above, so 800mm scope, focus position will be at let's say 785mm or something like that. So physical distance changes by small amount, but focal length of instrument changes more. 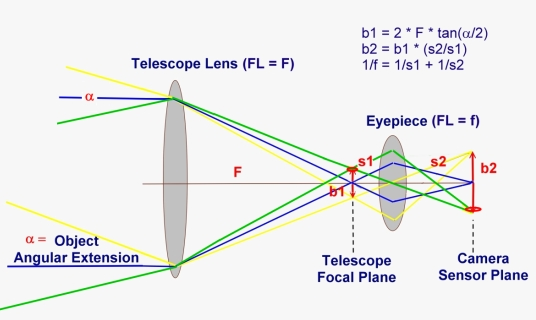 Don't mix physical position of focus with focal length of instrument - just think of SCT/MCT type telescopes - physical distance between front corrector objective and focal position is very small, but focal length of instrument can be large. It is not even due to folded light path - take for example 102 mak - it is about 30cm long, but has focal length of around 1300mm. Even if you account for light traversing length of tube 3 times, it is still not enough - this is because secondary is amplifying with such scopes (similar effect of barlow lens). In case of 55mm distance between reducer and sensor - if you look above diagram, shortening of physical distance will be fraction of this last part, so maybe one fifth or sixth of 55mm - about 10mm. This is because light rays travel "regularly" until last 55mm when they are bent. As for EP configuration, we need to get nomenclature straight . Let us give "proper" names to configurations (instead calling them 1 and 2 to avoid confusion). 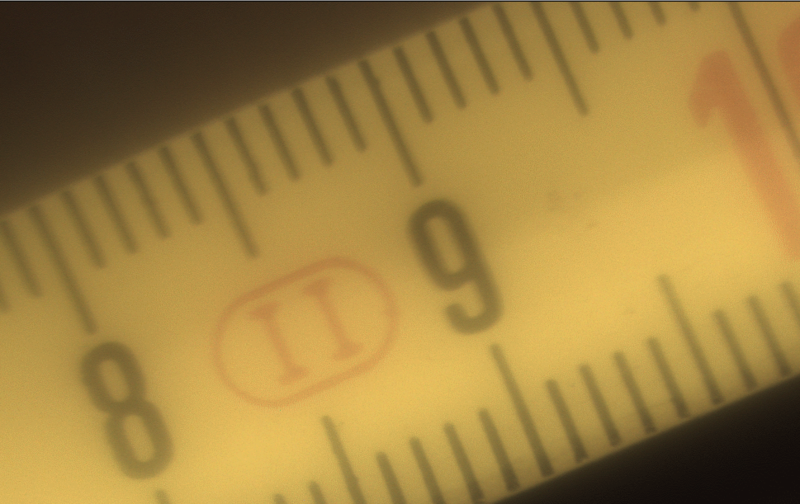 (you need to bring sensor very close to get what you got - F/4.7, around 1.2mm, but we don't know exact point from which this distance is measured - we assume it is somewhere around eye lens, but can't be sure where - it is up to eyepiece design). If you increase distance to sensor in this configuration, you will get larger reduction, but you will need more in focus travel - something that you don't have on ST80 since you already pushed it in as much as it'll go. Here by moving sensor closer to eyepiece you increase reduction factor (opposite from Prime focus EP configuration where moving sensor closer to eyepiece reduces reduction factor). In this case you will certainly be able to reach focus for higher reduction factor because all you need to do is add extension, and there is no obstacle to do that. You can even use diagonal - as it will act as extension. Good eyepiece/sensor distance will be around 20mm - this will give you fast F/2.5 system. OK - that's a lot clearer now - on both accounts . So I was doing the prime focus configuration Since the interest is in using the EP as a reducer, there doesn't seem much point in trying the 'proper' EP configuration, unless there's something exciting about it?? I think using a simple convex lens in place of the EP might give a better result with the prime focus config but might introduce some chromatic aberration. I'll have a go tomorrow if I can find the time and can rig something up - sticky tape and cardboard tubes, probably ha ha. Actually I think Proper EP configuration is better - you can achieve greater reduction with ease - no in focus problems. 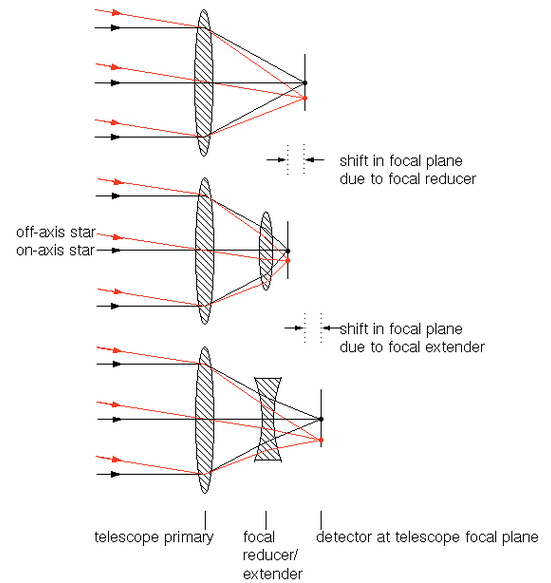 Sometimes eyepiece projection (proper EP configuration) is recommended for newtonians if one can't reach focus with DSLR because there is not enough in focus travel (focus plane is close to tube) - like in visual configurations when using standard height focuser (as opposed to low profile photographic one). Difference (yet to be determined, that was one of reasons for starting this thread) to simple two element reducer (GSO x0.5 for example) could be in quality of the field. CA is not only aberration that we should worry about. Field curvature and astigmatism can be amplified with simple lens. Most of photographic reducers are limited to x0.6 or above for this reason - they tend to preserve (or flatten) field. They are designed as either matching particular scope or with certain limitations - like need for relatively flat field instrument. Most eyepieces are well corrected optically and introduce minimal aberrations - so I figured that they will behave better at aggressive reduction ratios than focal reducers. Proper EP configuration could also prove better than Prime focus EP configuration because eyepieces are designed to "receive" diverging light rays - coming from focus of telescope rather than converging light beams coming into focus. +1 to both of you! Thank you for spending the time thrashing this one out - I too have often wondered about the theory and practice of using an EP for focal reduction. While I wait for EP T2 adapter, and recuperating from flu (and guess what - it's finally clear sky outside, but I'm still not quite well to do astronomy), I decided to test out EP projection parameters. My idea is to use EP projection as focal reducer and "squeeze" 20mm imaging circle onto ~8.8mm diagonal sensor. Initial trial will be with 8" RC and x0.67 focal reducer - that alone should "squeeze" 30mm onto 20mm imaging circle. Further reduction from 20mm to 8.8 should bring whole system to F/2.35 - that should be really fast. This image was obtained with 32mm Plossl and ASI185 (8.56mm sensor size), although I plan to use ASI178mcc for EAA (maybe 1-2 mm larger diagonal). It looks like this approach has good potential for EAA - looking forward to test it in the field. Thanks for your update, I also help you recover from the 'flu as quickly as possible.